Robot Schedule has gone mobile! Leveraging the power of HelpSystems Insite, the browser-based user interface in Robot Schedule is easy to deploy, allows secure mobile access, and has additional functionality that allows for greater insight into your critical processes. Let’s look at how the web user interface can make a difference in managing your job schedule. You won’t have to grab your laptop or notebook to keep an eye on those critical processes, access a job log, or rerun a job. Do it right from your phone—not with a miniscule 5250 green screen! The browser-based web interface features a responsive design that adjusts itself to fit your preferred device, from desktops and laptops to tablets and smartphones. The web interface also means that you need not install or update a GUI in order for your operations staff to monitor and diagnose issues with the processes scheduled in Robot. Only those responsible for creating jobs, changing job streams, and modifying objects such as calendars need to install the GUI on their desktop. Critical jobs lists are a new feature in the Robot Schedule web interface. They allow you to define and view those jobs critical to the organization, which must be watched closely. Multiple critical job lists can be created for different categories of jobs, for instance all MRP-related jobs for a particular manufacturing plant, all financial reports for a particular line of business, or all month-end reports. The critical jobs lists are used in various displays, including the Schedule Activity Monitor (SAM) and other dashboard widgets. 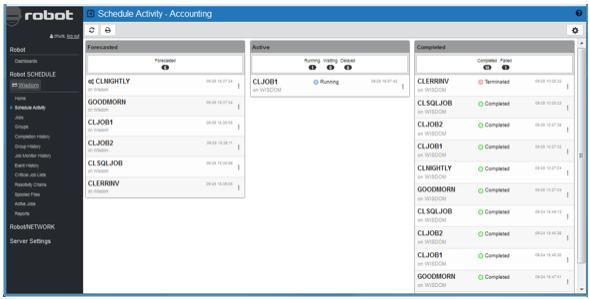 The Schedule Activity Monitor gives you features for overriding a job to hold it, rerun it, look at the job log or spooled files, and diagram its job flow. This last feature is exclusive to the new web user interface. Reactivity chains are a way to diagram event dependencies and highlight those jobs that are part of a critical path by showing an end-to-end diagram and the job status. 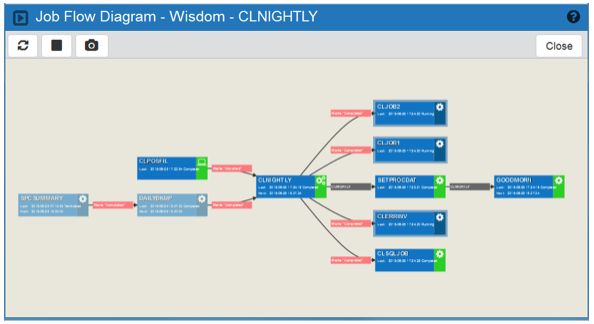 You select the first and last jobs to be included in the critical path and let Robot Schedule diagram the process from beginning to end for critical path monitoring and analysis. Job flow diagrams show you what is running right now, the job status, and its dependencies. They can be displayed from a variety of locations with the web interface, including from the Schedule Activity Monitor or the jobs schedule list. The diagram is initially a static display, but the play button in the top left animates the display and continues to retrieve the status of the jobs every 30 seconds. Jobs are color-coded as they complete and the dependency status between the jobs is displayed and updated automatically. Robot Schedule also features an active jobs list similar to the WRKACTJOB command that allows access to job logs and QHST and allows a job to be held, released, or ended if necessary. Find out how IBM i workload automation software can help you improve the efficiency of your job schedule. Request a free demo today.